Designing for self-builders requires simplicity in construction and building methods, but also creates possibilities to be very specific and explicit in space and presence. 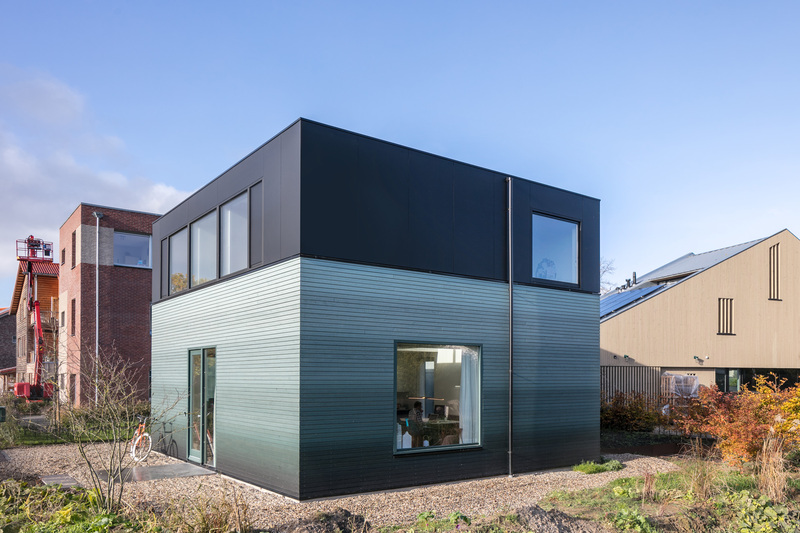 Anne and Merijn bought a building plot in 2013 in the new development area Vossenpels near Nijmegen. 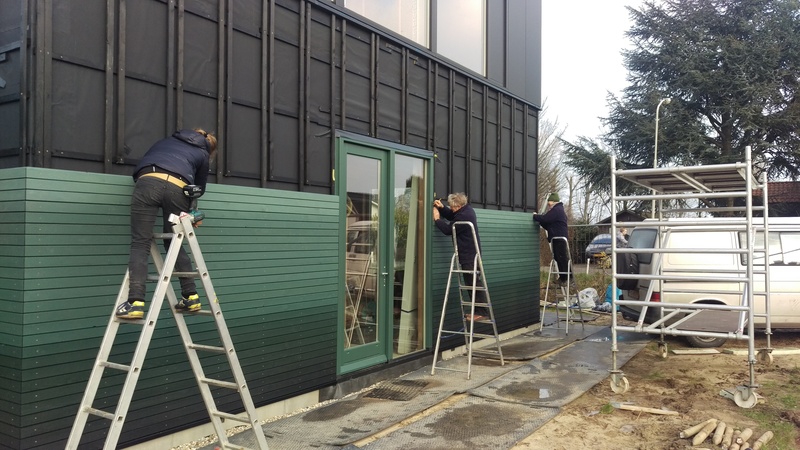 Without much help from construction workers, they have built a house themselves. It took them a few years but the result is convincing, with great precision in the details, it is built to perfection. Anne and Merijn bought a building plot in 2013 in the new development area Vossenpels near Nijmegen. 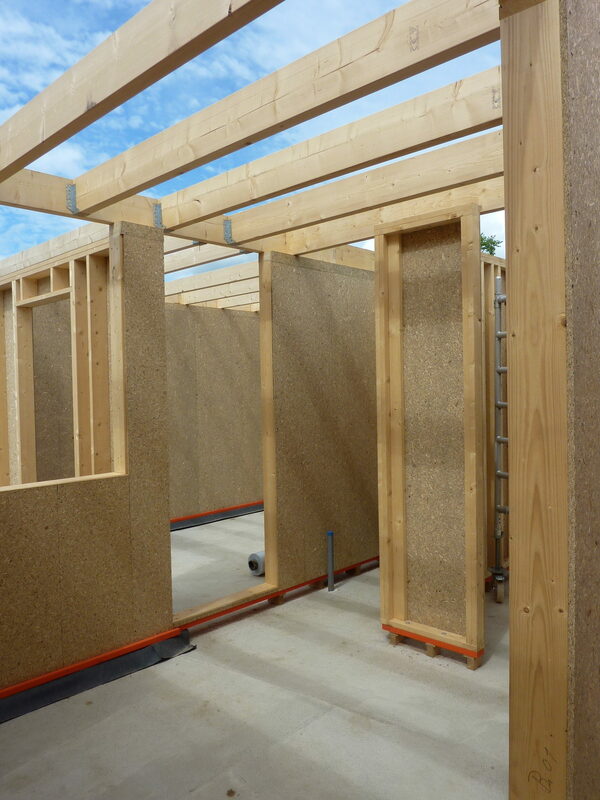 Without much help from construction workers, they have built a house themselves. It took them a few years but the result is convincing, with great precision in the details, it is built to perfection. 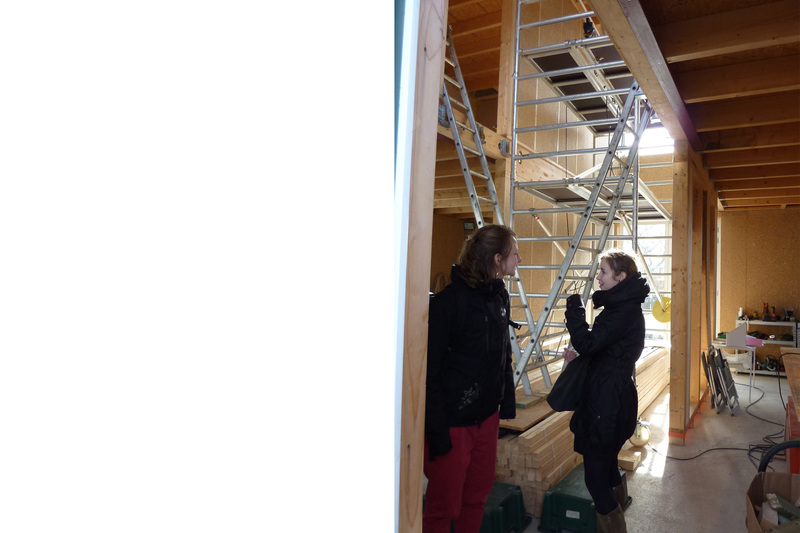 We look back with great pleasure on the collaboration in the design process, Anne and Merijn have self-consciously shaped their own living conditions. 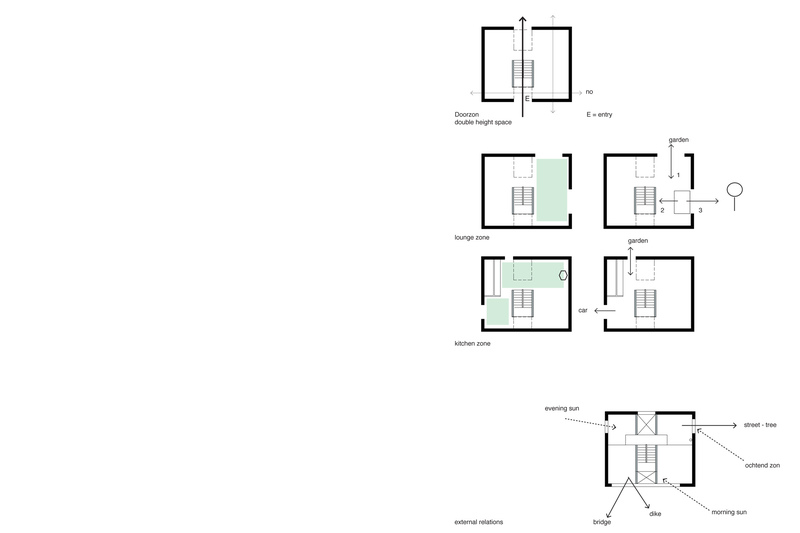 This is mainly expressed in the floor plans that have been designed in dialogue. 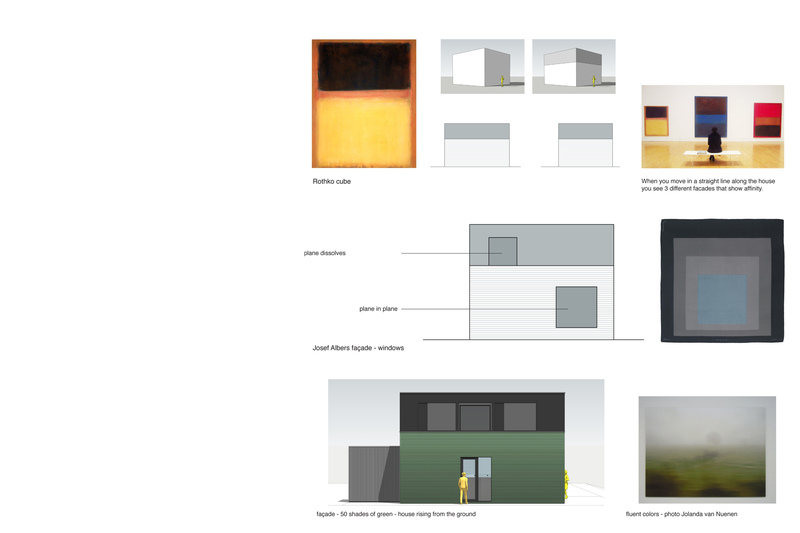 Anne is an art historian, the conversation about the appearance of the house and composition of facades arose from art references such as the work of Mark Rothko and Josef Albers. 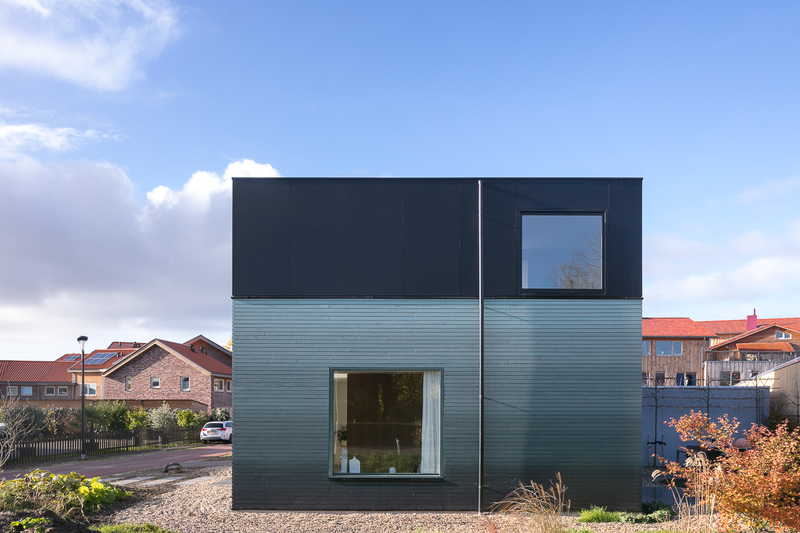 The house is situated on a prominent spot on an old country road that provides direct access to the new residential area from the dike of the river Waal. We decided that the house should give special meaning to this position and mark the entrance of the new urban area and express the transition of farmland to housing. But in an environment of individual private houses, that seem to be involved in a competition of self-expression, special meaning easily becomes an overstatement. 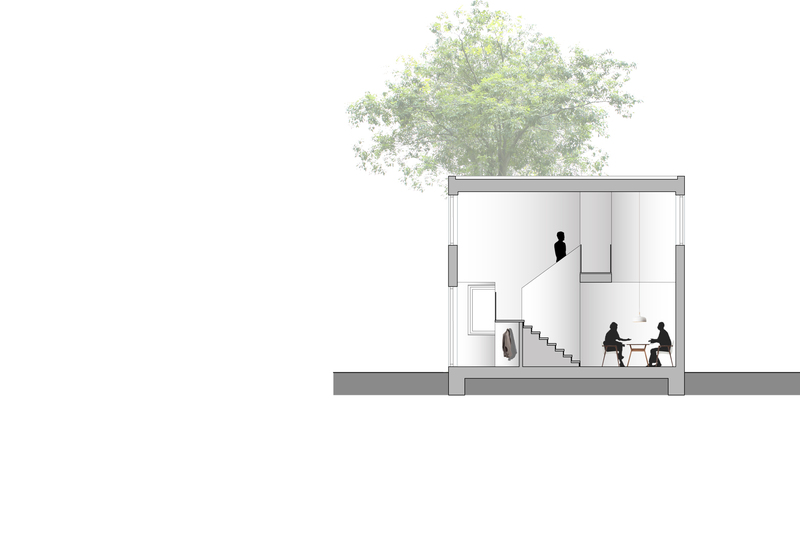 We therefore had to have an ambiguous design approach; being minimalistic and expressive simultaneously. So the house became a simple cube. 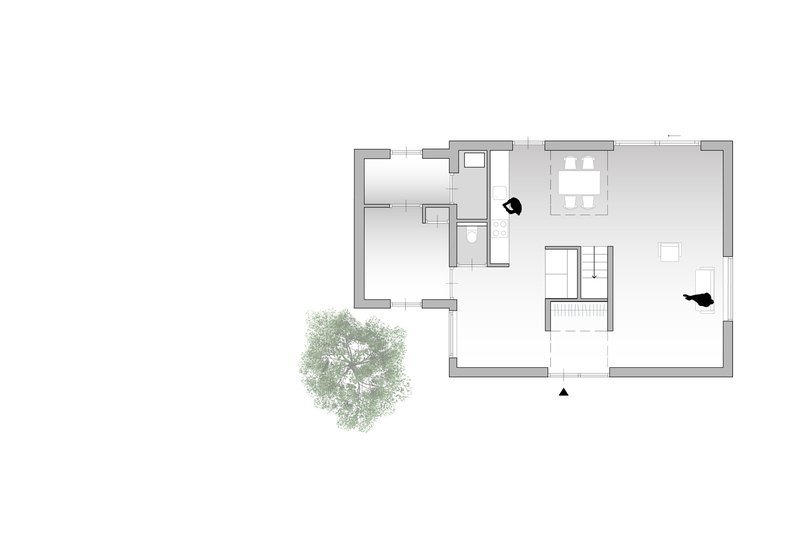 The proportions are changed by dividing the volume horizontal, making the house look lower and less significant. 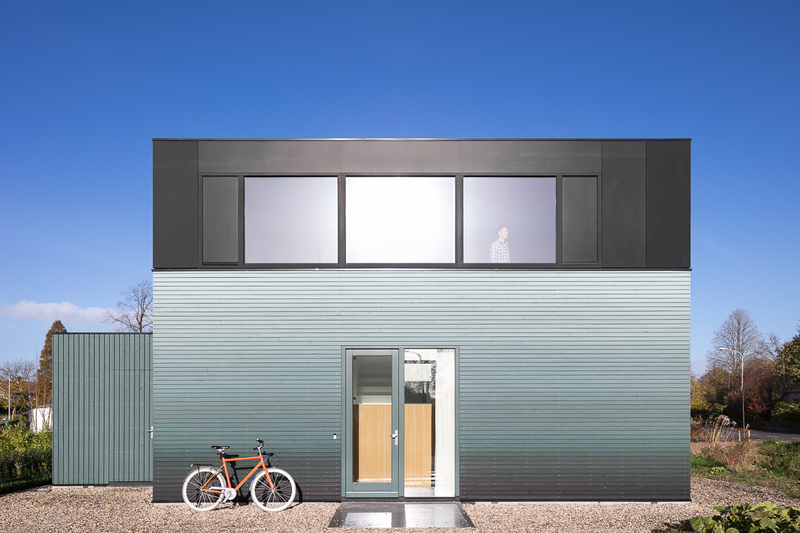 Over 3.5 meters, the façade finish consists of a black surface. The dark plates ensure that there occurs a night and day contrast, the height of the building seems to fluctuate. We obviously knew that Anne and Merijn would paint the house themselves. This made it possible to do something expressive with color. For us the image of a misty farmland river landscape where colors flow into each other became a narrative representing the former scenery. 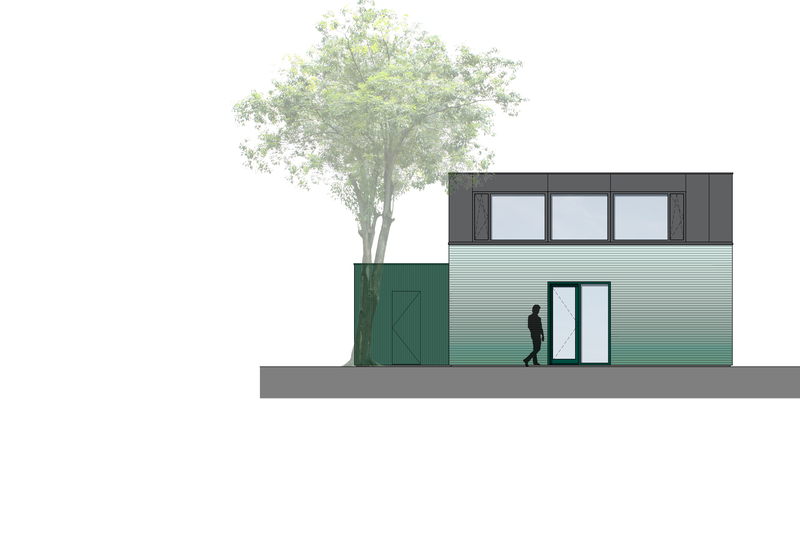 So we proposed to paint 50 layers of wooden cladding in a gradient of different shades of green. There were some laughs about 50 shades but they agreed and accomplished the enormous amount of work themselves. 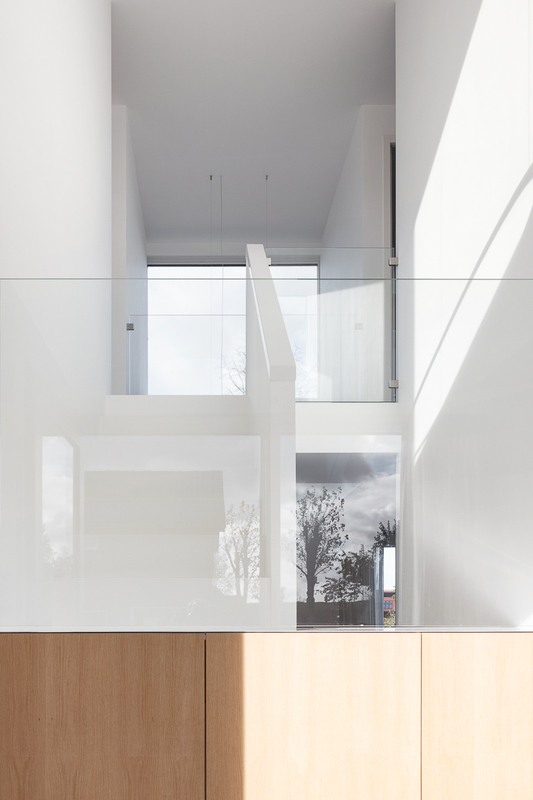 The ground floor plan of this family house is a loft-like floor plan around an open staircase that provides the space with plenty of daylight. 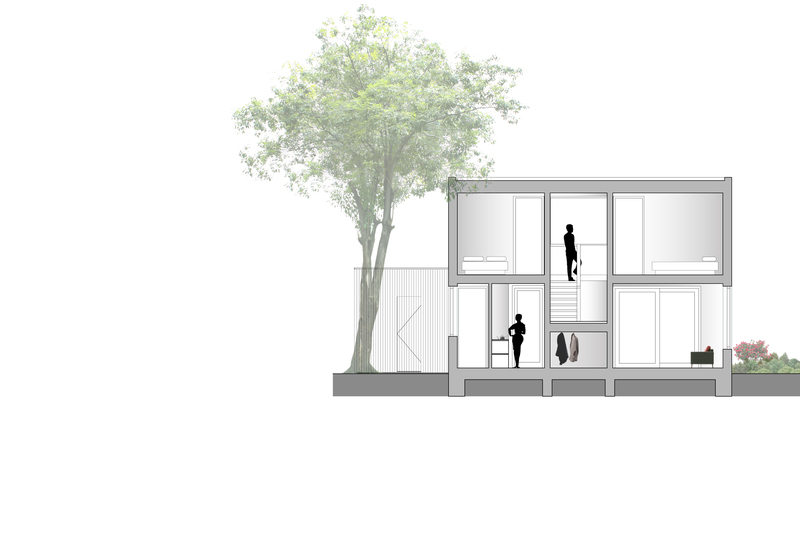 Openness in the plan is combined with designing specific spaces for the different living conditions. 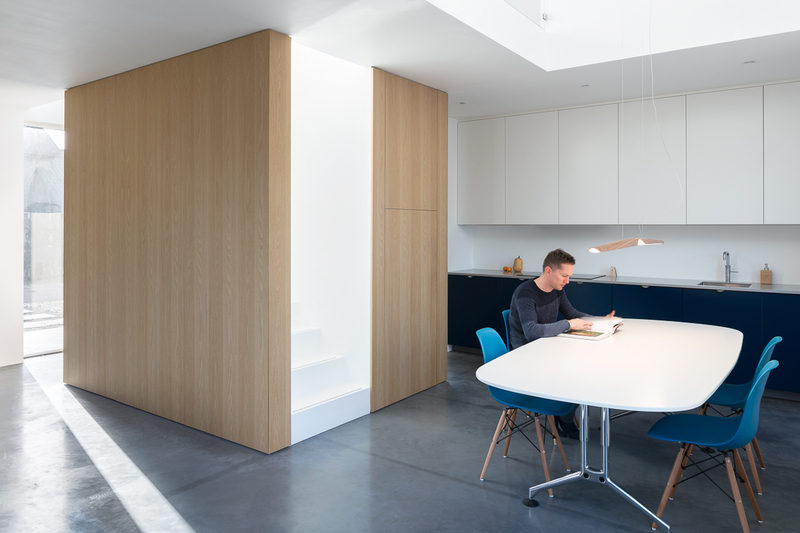 The relationship with outside through facade openings helps to create individual spaces within the open plan. 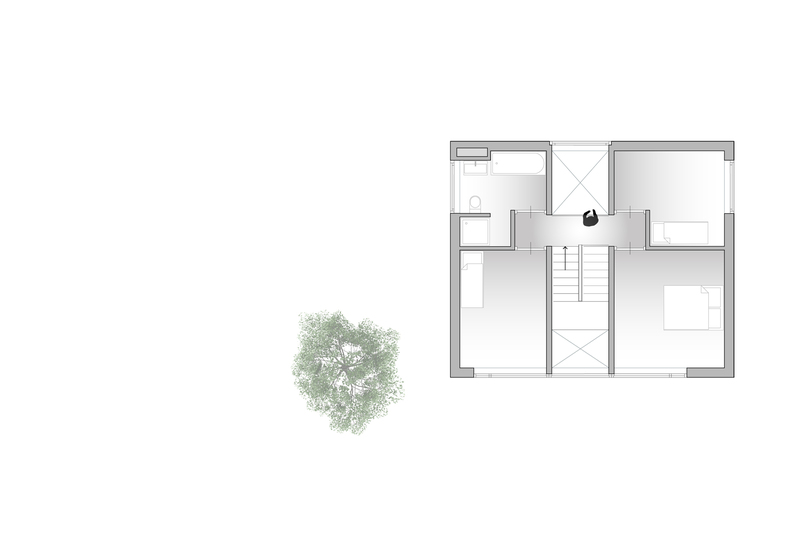 The first floor has a very logical structure organised around the atrium into three bedrooms and a bathroom.